This is always the fun part of projects because people try to let their creative minds go to work and dream up fabulous ideas. Many people succeed but most wind up either changing the plans or scrapping them all together. Me, I like to start out small and where there is room, expand accordingly. I have built a few cars in the days but this is my first truck so it should be fun. I'm not going after some monster truck type of set up nor am I trying to make it too classy and non-functional. I want a nice looking truck that can be shown as well as still run off road. After all, why put so much money into if you really can't enjoy it. Originally was going to keep the two tone black/silver but later decided to go with all black and add some graphics to it. All trim and mouldings to be removed. Badges to be air brushed back on. The first mod made to this truck was a simple lift of 2 1/2 inches to make it look better. 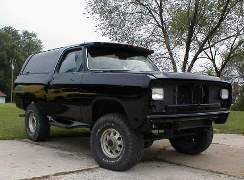 Something about a stock RamCharger just doesnt look right. Will be installing a SkyJacker 4" system. This will enable the rear blocks to be removed. No body lift planned as I'm not a big fan of them. Stock set up is the basic Mopar AM/FM cassette player with 3 6x9's. Haven't decided on the radio but speaker set up will be something like 4 6x9's, 2 3 1/2 enclosed and a custom box in the rear with 2 10" subs (maybe 12s) with quick disconnects for easy removal. One other secret mod planned.